Following on from the release of our 2017 Estate Pinot Noir last month (along with our 2018 Pinot Grigio and 2018 Pinot Rosé), we’re now pleased to announce the release of our 2016 Reserve Pinot Noir. Late last year this wine was awarded the Trophy for “Best Pinot Noir” at the 2018 Hong Kong International Wine & Spirit Competition, in addition to six gold medals in wine shows both in Australian and overseas wine shows. We’ve also just heard on the grapevine (pun intended) that esteemed wine writer James Halliday is going to feature this wine in an upcoming Winter Reds special in The Australian newspaper! This is a complex and powerful wine, reflective of its Reserve status. Fragrant aromas of dark cherry, blueberries and violets flow to a palate showing intense cherry and berry fruit flavours as well as earth and spice hints. With excellent length and balance this limited release wine can be enjoyed now, yet will also reward careful cellaring. More details can be found here. (a) our 2017 Reserve Chardonnay (made in a richer, fuller bodied style than the Estate, with ripe citrus and stone fruit flavours, this wine was awarded a gold medal at the 2019 China Wine & Spirits Best Value Awards in February this year). (b) our 2017 Sauvignon Blanc (crisp and dry with lovely citrus and gooseberry flavours, this wine was awarded a rare double gold medal at the 2019 China Wine & Spirits Best Value Awards in February this year). You can purchase any (or all!) of the above wines via our secure online shop here – remember that you can mix and match with any other currently available wines and the minimum order is only 6 bottles (with orders needing to be in multiples of 6 for shipping). We are now approaching the final stages of picking vintage 2019 – one of the most compressed vintages I have ever seen! I suspect this will be a more regular occurrence thanks to climate change, so we have better get used to it. The upside is we will get more of a break between vintage and our winter work – now that does sound great! Whilst vintage is always a “marathon” event – very long weeks organising and working with lots of pickers, many of whom are foreign backpackers with virtually no local knowledge, handling the logistics of ensuring snips, buckets, bins, forks, pickers, trucks, porta loos etc are on the correct blocks for picking – this vintage has been particularly “manic”! The later varieties such as Sauvignon Blanc and Riesling decided to develop flavours amazingly early and needed to be picked about the same time as our Pinot Noir and Chardonnay. To get through in a timely manner we have been picking up to 4 vineyard blocks per day – which is a considerable stretch for our teams. Usually vintage proceeds in a more “orderly” fashion, but not in 2019! Fortunately the weather has been with us, I think we only lost one day of picking due to weather. The grapes have been excellent with some great flavours, generally smaller berries so more concentration of flavour and colour, and the volumes more like average so the vines have handled the fruit load quite easily. 2017 Estate Pinot Noir – Late last year, this wine was awarded the Trophy for “Best Tasmanian Wine” and also the Trophy for “Best Tasmanian Red Wine” at the 2018 Royal Hobart Wine Show! To back up this dual Trophy success, this wine has also received gold medals both in Australia (2018 Royal Hobart Wine Show and 2019 Sydney International Wine Competition) and overseas (2019 Berliner Wein Trophy Competition, 2019 China “Best Value” Wine & Spirits Awards and 2018 San Francisco International Wine Competition). This cool climate Pinot Noir has a little more palate weight than the 2016 version (reflective of the warm vintage), and has a complex cherry and spice nose. The palate has spicy dark cherries and plums, as well as hints of dark earth and minerals, supported by excellent fine grained tannins. This wine may be enjoyed now or confidently cellared – a great food match would be game dishes. More details of this wine (including other accolades) can be found here. 2018 Pinot Grigio – Pinot Grigio wines are made from the Pinot Gris grape. The reason they are called “Pinot Grigio” is a reference to the style in which the wine is made – usually crisp, fresh and delicious, designed to be chilled and enjoyed young. Our premium cool climate Pinot Grigio reveals a complex nose of apples, pears and mixed spices. The palate is dry and crisp, showcasing a combination of spiced pear and apple flavours. This wine may be enjoyed now or cellared for a few years, when it will gain increased palate richness. Food matches would include spicy Indian and Thai foods, especially those with a touch of sweetness – or even with simple fish and chips! More details of this wine can be found here. 2018 Pinot Rosé – Made from 100% Pinot Noir, this easy drinking style of wine shows enticing flavours of red currants, cranberries and strawberries on the nose and finishes crisp and dry. Best served chilled, it is ideal for informal entertaining and would suit a wide range of foods – such as barbequed Tasmanian seafood. More details of this wine can be found here. Vintage 2019 – And it begins…. 2012 vintage Cuvée Sparkling – with six years on lees, this is a richly flavoured wine with lemon and almond, yet finishing clean and crisp. It went down fantastically well with patrons at the recent Taste of Tasmania and is perfect with oysters. 2017 Riesling – drawing on fruit from our (now!) 45 year old “Old Vine” block, this wine a little drier than the 2016 version, with lovely citrus and green apple flavours. 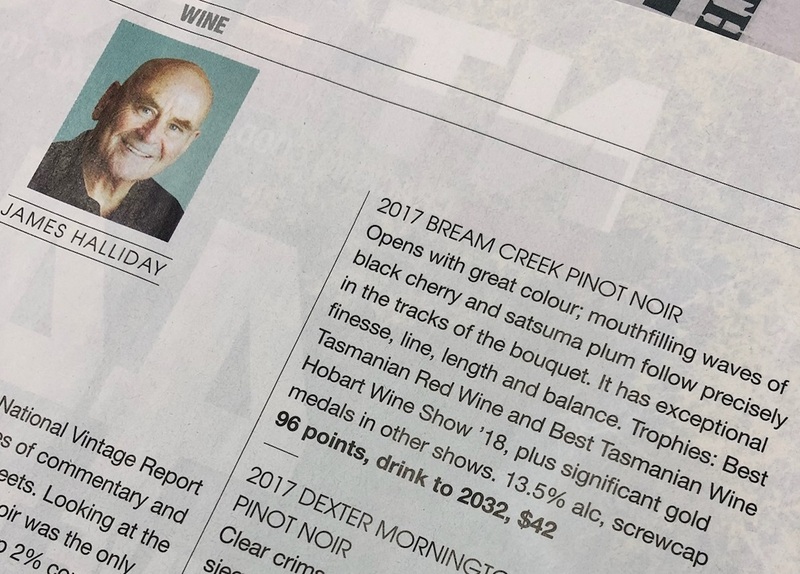 It has already been awarded 1 gold and 3 silver medals, as well as 95 points from James Halliday, 92 points from Huon Hooke and 4.5 stars from Winestate Magazine. 2017 Chardonnay – released on the 1 of January at the Taste of Tasmania, this is a richer Chardonnay that usual, reflective of a warmer 2017 vintage. Think citrus, grapefruit as well as stone fruit and spicy French oak. While drinking well now – it has already been awarded a double gold medal just last month at the San Francisco International Wine Competition, as well as another gold medal at the 2018 Asia Wine & Spirit Awards – we think this premium wine would also benefit from cellar time. 2017 Cabernet Merlot – a rare wine in the Pinot Noir dominated wine scene of Tasmania, this is our nod to the Bordeaux wines of France. Cassis/blackcurrant and dark plums, herbal hints too, with evident tannins and good acidity. It will evolve into something special with time in the cellar, although it pairs very well with rich meat dishes and strong cheeses now. You can purchase all of these wines, as well as any of our other current release wines, via our secure online shop here – remember that you can mix and match with the minimum order being only 6 bottles, and we accept payment by Visa, MasterCard, Amex and Direct Deposit. Vintage 2019 is fast approaching, and if this hot, dry weather persists it could be a lot earlier than we initially thought. In the south it has been exceptionally dry and consistently warm to hot. The older vines seem to be handling it surprisingly well, courtesy of a very dry spring which enabled the survival of their deeper vine roots. Hence we are concentrating our irrigation efforts on the higher and more exposed blocks, and the younger vines that have yet to fully develop their deep root systems. With some pretty mizzly, drizzly weather during the flowering of some blocks, there are some smaller berries in bunches where the pollination was incomplete – hence I am expecting only fairly modest bunch weights and yields. Coupled with a continuation of this weather pattern, this will also accelerate veraison and ripening. In fact we are seeing the early signs of veraison ie berry softening and a little colour, in Pinot Noir berries in our earliest blocks. Ah, the joys of applying bird netting are not far away!! We are looking forward to being part of Festivale in Launceston again this year! From Friday 1 February to Sunday 3 February in City Park, this event always features great music, and this year is no exception, with the Hoodoo Gurus performing on Friday night and Jon Stevens on Saturday night! This year you can find us in Stall 93 –similar to our location last year, facing the Pergola. Take the opportunity to drop in, taste our wines, as well as check out our new label. We are pleased to confirm that we will be at the 30th birthday of the Taste of Tasmania this year – and Bream Creek is proud to have been one of the original, and a continuous, stallholders! Starting on 28 December 2018 and going through to 3 January 2019, this will be a fantastic celebration of one of Australia’s longest running and most prestigious festivals! We will be inside the main Princes Wharf Shed – Stall 16, on the wharf side towards the river or eastern end of the Shed, on a corner facing the city. Take the opportunity to come and see us , taste our wines, and check out our new label! It has been a very mixed bag so far – ranging from an exceptionally dry winter and spring, to a recent week of mizzly, drizzly weather here in south east Tassie. We picked up 20 – 30mm of rain across our vineyard blocks, but it was a pretty agonizing process due to the persistent, drizzly showers and the prolonged heavy could cover rather than shorter bursts of heavier rain. We had a couple of chardonnay blocks commence flowering during this weather, whilst one of our main pinot noir blocks was almost mid flower. I would love to see a few weeks of warm sunny weather – with perhaps the occasional “worthwhile “shower – as opposed to our recent dull, cloudy conditions. But so far our vines look healthy and the growth is pretty good. Courtesy of the prolonged warm dry season last year, there are plenty of flower bunches on the vines i.e. potential grape bunches, across all varieties. At this stage it is certainly not looking like an early season, in fact I’m starting to think it could be one of the later seasons of recent years – but as usual time will tell! Long way to go yet! “Best White Wine” at World’s Largest Recognised Wine Show!